No, this isn’t a dead site. We had our first GAIT meeting of 2009 this past Wednesday and spent the time talking about goals for this year and who might want to take charge of them. Here’s a summary of what we decided. Barb Shelton will coordinate moving us toward 501(c)(3) status. There was a lot of interest in working on Safe Routes to Schools, especially in connection to the planned redevelopment at Issaquah High School. We’d especially like to get parents of school-aged children involved in an effort to push this issue with the school district and the city. I can’t remember if one person was going to take responsibility for this, but Tina Anderson, Barb Shelton, Karen Behm, and Erik Schneider all expressed interest. Karen Shively volunteered to become our parade coordinator for the year, so if you want to be in the 4th of July or Salmon Days parades, or have an idea for an entertaining entry in either focused on transportation, let me know and I’ll put you in touch with her. Finally, Karen Behm had the idea that we should meet with our new Police Chief and discuss issues of common interest. If you have something transportation-related that you’d like to discuss with the police, give a yell and we’ll add you to the meeting or add your issue to our list. I joined Bob Miller for the “Bridges of Issaquah” ride this evening. There were four of us plus Bob. I put a version of the ride pretty close to what we did up on Bikely if you want to see where we went. The most fun part of the ride for me was when we were cutting through the school administration parking lot to take the trail over to Dogwood (it’s not a bridge, but it’s a handy bit of ped/bike infrastructure that Bob chose to highlight). As we were reaching the end of the pavement, Bob noticed a bike off in the blackberries. It turned out to be a bike and a trailabike attachment. When we got to the bike’s suspected home we discovered that yes indeed, this was the stolen bike and the owner was very happy to be reunited with it. Everybody left there pretty happy and we finished up the ride catching the last couple of bridges on the route. 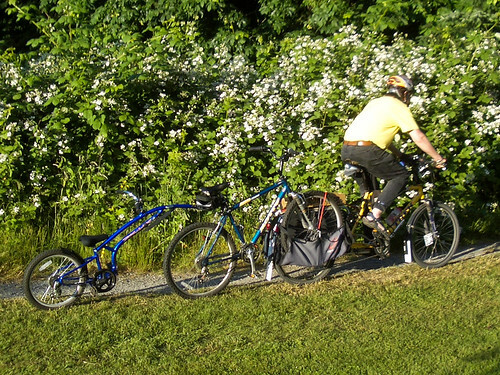 Bob Miller’s Bridges of Issaquah ride is now a weekly event every Thursday at 7pm starting from the Issaquah Community Center. If people are there at 7 then Bob will lead the ride. Don’t let light rain stop you, either! This is a great way to get used to riding around town if you’re new to bicycling around. And if you’re a veteran rider it’s a great way to make bikes more visible to our car driving friends and neighbors. For more info about the ride see the Cascade Bike Club page. If you’ve got kids in grades K-5, bring them out to Issaquah Valley Elementary this Saturday June 7th from 10am to 2pm for a Bike Safety Fair. I’ll be out there talking to people about GAIT. Should be a fun event. For more info call Bruce at 425-653-1089 or Miho at 425-653-1109. Bob Miller has come up with a bike ride that visits many of the bridges in Issaquah. He’ll be leading the ride next Thursday, June 5th starting at the Community Center at 7pm. This is an easy ride of approximately 10 miles at a leisurely pace. The ride is organized through the Cascade Bike Club and there is more info about it here. Come out and meet fellow GAIT members and be a bicycling presence on the streets of Issaquah. If you’re still nervous about riding on the street this is a great way to get some practice with some more experienced riders. If you have questions leave a comment or send email and we’ll get Bob to give us answers. I guess we should point out that May is Bike to Work Month. If you have been thinking about trying to commute to work by bike it’s a great time to get some help over the initial challenges. The full calendar of events is at Cascade Bike Club. May 16th is Bike to Work Day. Stop by the City’s booth at West Lake Sammamish Parkway and SR-900 from 6am to 10am. Here’s an event close by that will extend bicycle transportation to our neighbors in Africa. YOUR USED BICYCLE CAN MAKE A DIFFERENCE IN AFRICA! In Ghana, an impoverished country, the main form of transportation is walking – lucky ones ride a bike to work, school and the market. Please consider donating your bike to ARAS, a local non-profit foundation that is supporting the African Bike Project. All bikes accepted, regardless of their condition or size (no tricycles). May 9, 12 – 1:15 p.m.
Cycling is on the rise in Pacific Northwest cities, yet in Copenhagen, Denmark, more than a third of all commuters get to work on a bike. Alyse Nelson studied bicycle planning during the fall of 2006 and winter of 2007 to try to learn how the Danes created such a bicycle-friendly city. Her presentation will make the case for bicycle cities, present planning principles that make the bicycle a prevalent mode of transportation in Copenhagen, and provide details on how the bicycle fits on the street and in the city. The presentation will end with conclusions learned from Copenhagen and time for a broader dialogue with the audience. Report back if you go! WSDOT is working on their long-range (2008-2027) plan for pedestrian and bicycle facilities. Here’s a notice about the final public meeting on the topic. Note also the link and phone number for responding directly. I haven’t reviewed the plan. Let us know if you see anything to get excited about. Join us for the Washington DOT’s last local public hearing for the 2008-2027 update of the state’s Bicycle & Pedestrian Plan. See what they’re thinking and add your voice for more and better options for bicycling. The 60-day public comment period for the Draft Plan is open thru May 2008. You can review the background papers and the Draft Plan by visiting www.wsdot.wa.gov/bike/bike_plan.htm. Comments can be submitted either through the website or by calling the toll free number: 1-866-375-6729. Next week is National Public Health Week, and part of the observance is the designation of Tuesday, April 8 as “Travel Differently Day”. So if you’ve been looking for an excuse to walk to work or ride your bike to the store or ride the bus for a night on the town, here’s a little extra incentive. Lots more info at the link above. In addition to NPHW, Rails-to-Trails Conservancy is promoting ped/bike transportation with their Burn Calories, Not Carbon!™ Pledge. By telling them that you’re committing to get around under your own power you give them valuable ammunition to advocate for more trails all around the country. Win-win!